Powershop has been offsetting 100% of the carbon associated with the production of our customers’ electricity for almost three years. 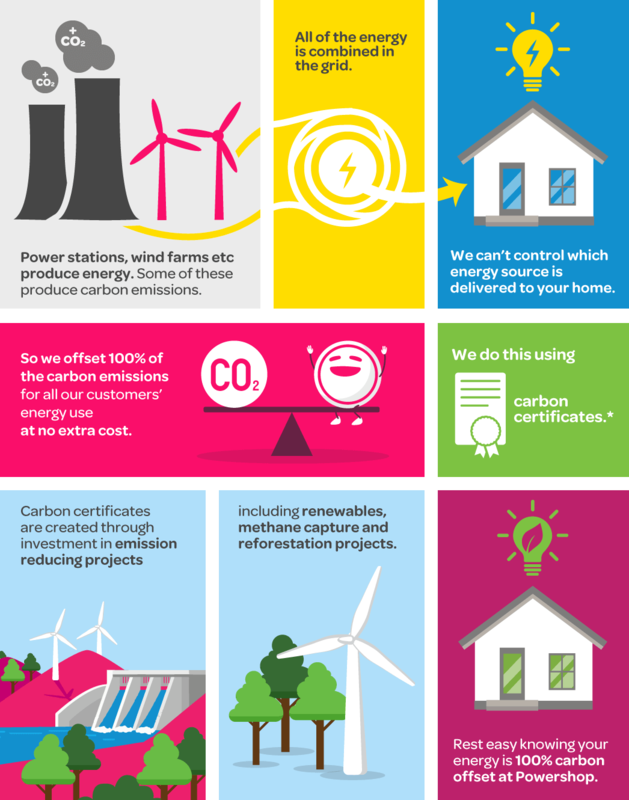 We sometimes get queries around our decision to go 100% carbon neutral and how it works, so we thought we’d take a little time to explain how carbon offsetting works and why we do it. No matter which energy retailer you buy your electricity from, it all comes from the same central pool because all energy retailers in Australia buy their electricity from the National Electricity Market (NEM). Although our parent company (Meridian Energy) only puts energy generated from renewable sources into the NEM, in the end we can’t control which electrons are actually delivered to our customers’ home or business. So, we made the decision to offset 100% of the carbon emissions associated with our customer’s electricity use to help customers reduce their carbon footprint. Carbon offsetting is a process that involves a reduction in emissions of carbon dioxide (or greenhouse gases) in order to compensate for, or to offset, an emission already made elsewhere. To do this, we purchase Certified Emission Reduction (CER) certificates from sustainability projects around the world. These projects are developed under the United Nations Framework Convention on Climate Change (UNFCCC) Clean Development Mechanism and they generate CERs that we can then purchase from carbon offsetting markets. We purchase enough CERs to cover the carbon generated for our customers’ energy use and to cover the carbon emitted as a result of our business’ everyday activities (travel, power usage, etc). We employ a rigorous selection process when it comes to purchasing our certificates and the CERs that we purchase are accredited under the UNFCCC Clean Development Mechanism. CERs can be from projects such as energy efficiency projects, those that involve the destruction of industrial pollutants or agricultural by-products and projects involving the destruction of landfill methane. In addition to purchasing these CERs, we also purchase voluntary credits from Australian carbon offsetting projects. We specifically make sure we don’t purchase anything associated with palm oil production. Although we know these schemes aren’t a perfect solution, they are a way to have a positive impact on the environment and begin addressing the issues that we as a planet are facing today. Check out this short video below to learn more. 13 comments on "Powershop & carbon offsetting: What, How & Why"
Any idea what the price per ton of CO2 is for your credits? How does it relate to a realistic price on Carbon pollution needed to reduce emissions fast enough to meet Paris goals? The cost of carbon reduction certificates varies between projects and fluctuates with the market. In terms of our contribution towards meeting the Paris goals, our renewable electricity generation company Meridian Energy produces electricity from wind farms and hydro, plus all the electricity and gas Powershop sell and all of the emissions associated with our office, air travel etc. is all offset through carbon reduction certificates. The purchase and surrender of these certificates helps fund carbon reduction projects all over the world, whether that be helping a developing country build a biomass power plant or helping protect Tasmanian native forest. This all sounds great but I am just wondering if helping developing nations to develop bio mass power plants includes the production and burning of wood pellets. I know that this method is officially declared being carbon neutral. However there is sufficient scientific evidence that it not only kills our forests, it is also producing a lot of pollution in the production of the pellets as well producing carbon when burning. I’m confused, what’s the difference between carbon neutral and buying a green power pack and paying more in the app? You say that what you pay for carbon reduction fluctuates. So approximately what percentage of our bill goes towards this cost? In fact, I believe that the whole planet warming by excess carbon emissions is a massive hoax generated so as those who have can have more. We hear doom and gloom from those (scientists?) who are making a motser out of this – why would they say anything (like it is all a repeated cycle of the planet’s weather over hundred of years). I didn’t realize that Powershop paid for these certificates on all electricity sold, just on “green power” – which is the customers own choice. You are not giving me a choice, your answer to my question will determine my decision. However, since I changed to Powershop, I have been quite happy with your service and your prices, so I’m going to have to weigh up my options. Can you point me to where I can see the carbon certificates that have been purchased by Powershop or Meridian? Hey there, we use a mixture of both international and Australian carbon certificates from a range of different sources. We don’t have a list of all these available, but you can find a bit more info here. Can you display your Certified Emission Reduction certificates? It would be more convincing to see evidence of these. Hi again, see the above reply for an answer here.